Toby -Collie looking for a home . Well guys this is Toby. He is approx 12-15 months old and is truly fantastic. So why is such a fantastic dog looking for a home? So here is my honest opinion on him to give you the best understanding of him. He has very good toy drive to a dead and moving toy. Loves a game of ball and tuggy and he does not bat an eyelid at being touched, inspected, eyes, ears, legs, mouth and collar grabs are no problem at all. (as you will see in the video) There is absolutely no food aggression in him at all. He isn’t to keen on cars travelling from behind of him but after 5 minutes sat by the road he soon learnt it was far more rewarding to keep his eyes glued on me. He met horses today, I believe for the first time. He was a bit barky/unsure when they moved (Scary things) but as soon as the toy or reward came out the more beneficial thing was to work with me and he continued a game of tuggy and walking through them with no problem. I have had him in a harness as he pulls on lead. I don’t want him pulling on his neck and haven’t had much time to do much with him but again I don’t think he has seen a lead much. He has no problem with anything being put on him and with a bit of time he will fab. There is a video of him below on his first outing with me. Please pass on this and share the blog if you know anyone that may be intrested. 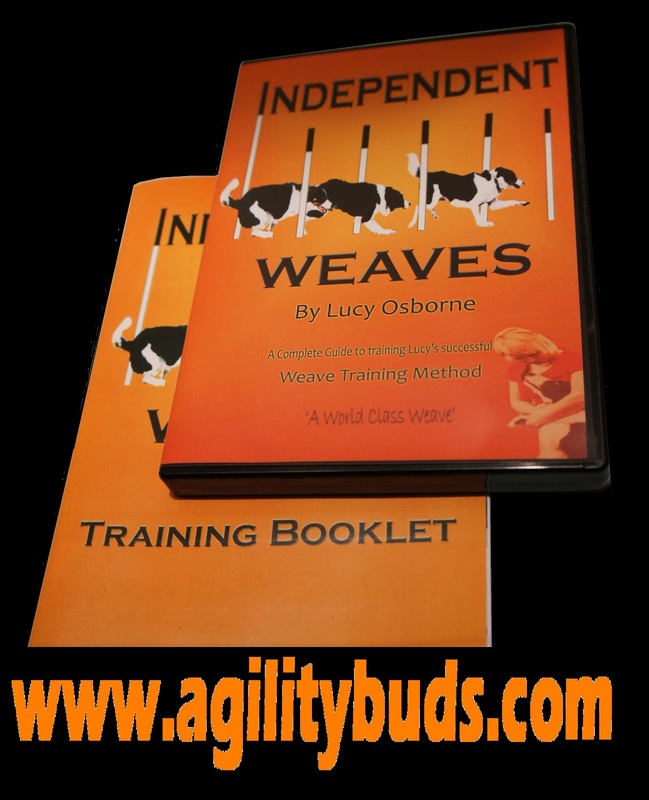 There are many tricks we can teach our dogs that have a big relevance to agility. You don’t have to use agility equipment to be training for agility! Through a series of articles I aim to give you something to train with your dog, without having to even go out of the house. A new trick, each month that, over the series of articles will be aimed at different aspects of agility preparation and training. From body and self awareness to strengthening muscles and toning up. 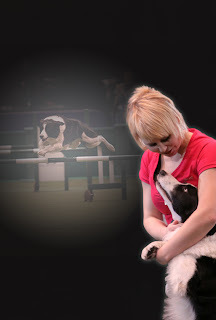 This is not just something you can do with your young dog try it with your competing dogs too. Training sessions should be no longer then 5 minutes long. Which isn’t very much time IF you don’t plan what you want to get from the session. However, you shouldn’t expect the end behaviour within the first session. Break the sessions up. I have always got better results from a shorter planned session. Plan what you want to do, write it down, then train and look back at what you have done. Have you accepted something different and gone off on a totally different tangent? I will show through pictures and text the stages in which I mark ’click’ the behaviour and then how I progress it after each session. You should see this through the articles. How do we start? Above I said that it is important to plan. To plan you need to see in your mind the finished look and what the description of the finished behaviour should be. Then in stages think about a not confusing and fun way in which you can teach the behaviour and more importantly getting the dog to understand and learn the behaviour. I’m going to start with a box, it doesn’t have to be a special size, style or be decorated. Mine was picked up from the local fruit and veg shop, something that isn’t too high/deep. 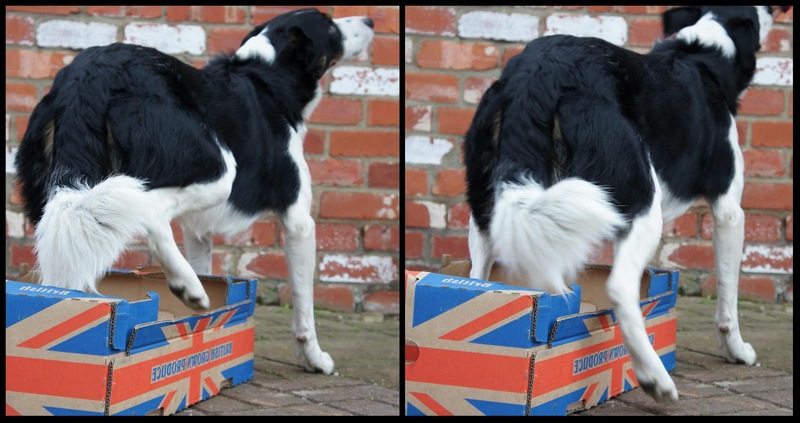 Before I begin the actual training for this trick I’m going to let my dog investigate the box, let them have a sniff. 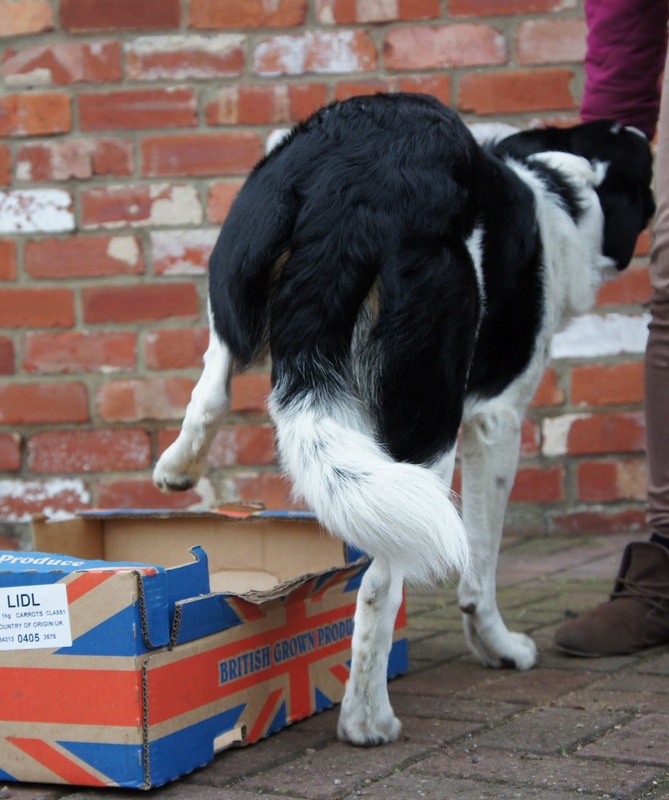 And walk them through the box, I won’t train my dog with a ‘prop’ that they are not comfortable with. I will reward my dog for interaction with the box. Once my dog is comfortable with the box and walking through it I will then begin my training. Stage 1 In the first session I am going to reward my dog for splitting his rear leg over the box. I won’t reward highly for this. I would reward this with a mediocre treat. Once the dog is splitting its rear leg over and out of the box I will then move onto stage 2. Some dogs may get this in the first 5 mins others may have to do a few sessions before their dog offers the behaviour. I am not going to use a clicker for this as I just want my dog to be aware of the movement, I will use a clicker in the next stage. It should look something like the pictures below. Below is a picture of where I would click and where I wouldn’t. I am going to click when the dog is lifting his leg at the point that the lifting leg is as far away from the ground, as the dog is going to lift it. Click and reward with a higher value treat. You do not want to click when the dog is putting the leg down as shown in the above picture, next to the cross. This would be telling the dog - I’m rewarding you for the behaviour of putting the rear leg down and not the lift. 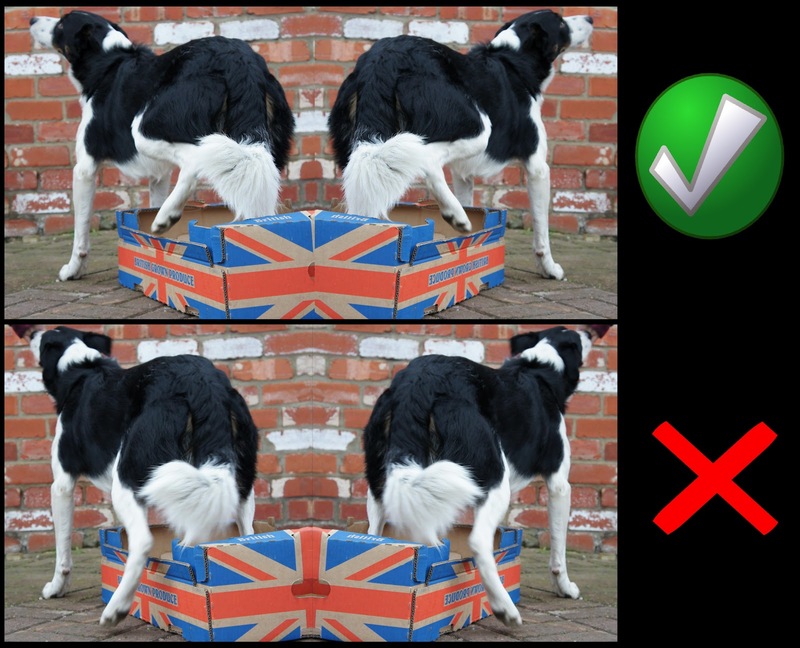 Make sure you practice the lift on both of the dogs rear legs. The picture above should illustrate this enough .You will find that you dog has a weaker side, just like humans. Help the dog even out by practicing the weaker side too. Stage 3 - Holding the lift. If your dog understands what they have just been getting clicked for they should begin to start to offer holding the behaviour if you withhold the click slightly. If not have you been rewarding in the right place? This is a good indication that there may need to be a few more sessions marking the lift. Gradually start withholding the length of the click once they are holding the positions and not lifting and putting back down. Mark each increased hold with the highest value treat followed by lots of praise and games. Don’t ask too much and expect your dog to stand there for a minute. I have taught Stig to hold for about 3 seconds he will hold for longer but it’s not necessary for me to have him holding the position for longer. Here is some pictures showing the stages in which I trained this trick to another dog. For a dog who’s being shaped the 2on2off contact position I feel this is the easiest way in which to teach it. First I’m going to reward one leg lifting to the box no clicker or vocal just a treat. Once the dog is consistently touching with one leg I’m going to click the lift. Only the lift not when he is touching the box. I am then going to move the box away and reward. 3. Keep my dog focused and thinking about his rear legs in a long queue by the ring. 6. Looking in them or pulling something out. Its not such a pointless trick after all! Geez I have been a Right Blog Slacker, I cant believe that a month has gone since I last updated. I’ve been very busy teaching and trying to find time to train my own dogs. So a quick catch up is needed, I think! What I have actually managed to do with my dogs, appart from walk them Hummm this should be short! 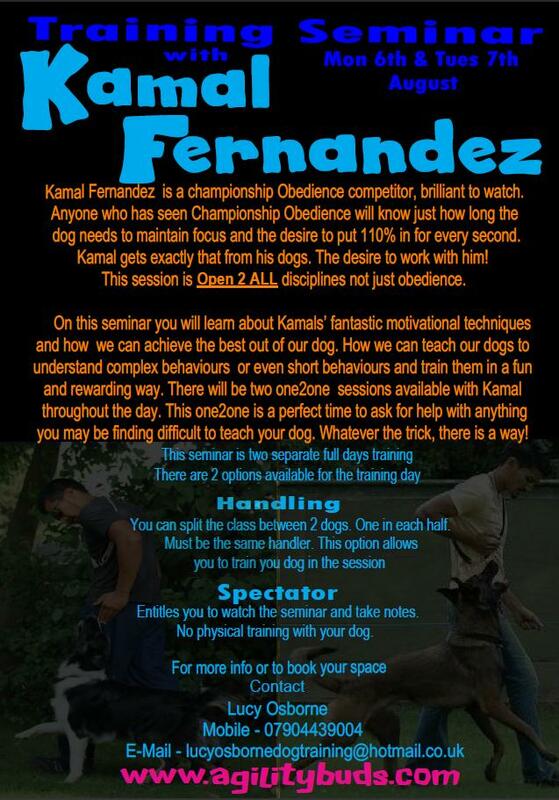 February 4th Dave Munnings had organised a training seminar with Kamal Frenandez and invited me on it. I didn’t know much about Kamal at the time of the event and with being in South Africa and then very busy when I got back I never had the chance to even ‘google’ him and find out some info first which is unlike me. It was then the 3rd. Dave had just told he that Kamal competes in Champ level obedience and was fantastic at shaping, and getting focus so I was interested. I didn’t really know what to expect and being fairly open minded to what the day was going to entail so packed the notebook and pen to take as many useful notes as I could. I set off very early on the 4th to get there. After my Sat Nav decided that it was going to take me to the middle of a single track road and say ‘Destination’ hummmmm thanks for that TomTom! I managed to find the location and be 30 mins early, god only knows how that happened. So the session started and Kamal asked everyone for a BRIEF description of what everyone was looking for and about their dogs. STIG - Gets a bit too excited about working, need to gain more controlled focus in new environments, looking for more rear leg exercises. Fairly brief for me! The session started and all the dogs came in and we played a few games which were really good. I was pleased because some of what Kamal taught in his ‘games’ were similar to my ‘Games’ just different names. One of the games what I don’t do but certainly am going to now made me more aware of Stig following body language more then the command. So I was straight back to the note pad writing what I needed to train and work on so i didnt forget. I feel that in agility and me not having the fastest legs in the world! my dogs need to understand verbal aswell as body language so I have been working on verbal commands only and testing them without body language as back up. ie. Pull though command, Left, Right, Come, Go, Wing Wraps and I’ve put a note in March training exercises to go over it again. Kamal wasn’t talking about agility when we were all playing that game it was general sit, down and stands but that’s the secret and importance of a notebook and pen, You can jot it down go away and think back over the training and plan how it can help in other areas too.It definitely made me think. Thanks for that. One2ones I had a one to one with Kamal in the afternoon, we focused on rear leg work, I’ve done a lot recently with Stig because of his pole knocking last year. Kamal recommended grids first which I have tried with him and not just for a week either I have tried to stick to them and followed and researched methods but after a month he was getting worse, grids, they wind him up so much. because once he knocks a pole he get more wound up and tried to try harder but because hes getting wound up he forgets then about everything else. Nutty dog! I wanted something I could do in the house, where he would be calmer to learn it and then I could it take outdoors. I couldn’t see what I was meant to be marking so Kamal worked Stig so that I could observe. I wanted to be clear and to be marking the behaviour correctly and know what I was to be looking. Watching stig work really useful. I’ve been working on the exercises Kamal gave me and they have been FANTASTIC. I am now doing the exercise in my warm up routine and he is lifting his rear legs now. Whereas before he would hit one pole and plough down the rest now if he hits one he is really trying hard with his rear legs and thinking about them more. There is massive progress. So all in all that was a really beneficial day for me and I’m glad that I went. Being able to watch the other one2ones were great too because I could observe how Kamal would teach other behaviours. Most, I had already taught to my dogs but its good to see other methods and to have them stored up as a plan B if plan A doesn’t work when teaching. I have asked Kamal to come and teach at my venue and I have managed to get him on 6th and 7th August, if you click on the picture below it should enlarge. There is info on there about Kamal and how to book your spot. I then had two weekends of one2ones and classes at my own venues And resumed my weekly classes after a month off.. Can safely say all of the dogs were off their heads, and had missed it. I have had some training evenings over at Halifax and at my venue . The Fun Filled Puppy Foundation went down really well and I received lots of good feed back so im now running a Fun Filled foundations class every other Wednesday. So much fun shaping and teaching new behaviours getting out young agility dogs as confident and bullet proof as we can before we bring them into the agility world. I was then over in Northern Ireland teaching for the weekend, it was another fantastic weekend as it always is over there. I stayed with Kirsty and Irene Jess. I went out Saturday evening with Kirsty and Curtis Mullan. I had a fairly sensible night and only had a few drinks I wouldn’t possibly think of anything worse then teaching with a hangover and lots of noise. So a sensible night… The music was so loud my ears were ringing until Monday. Some weave training, foundation training and advanced training. Cant wait to get back over there in May Judging and teaching. 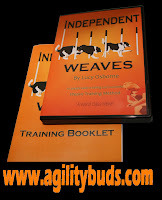 This weekend I was at Dans’ teaching Foundation/ Drive work then Foundation weaves and independent weaves following my system, some good reviews and more people going to teach my method. I then had a Super see saw session which had a mixture of breeds and lots of talented dogs . I have started writing for the Agility Voice too so I will post my articles on here once the edition has been sent out. So its Crufts next week, I’m not competing this year, I’m glad in a way because otherwise I wouldn’t of had time to retrain Bens A-Frame I’ll just miss the A-Frame out at the coming shows. I’m going to cheer on some students and catch up with some friends. It will be strange not beeing it agility etire. Looking forward to the start of the show season now! First KC show is on 17th of this month so not long now.